I read the comments and just don't agree I like how this looks. Good idea. 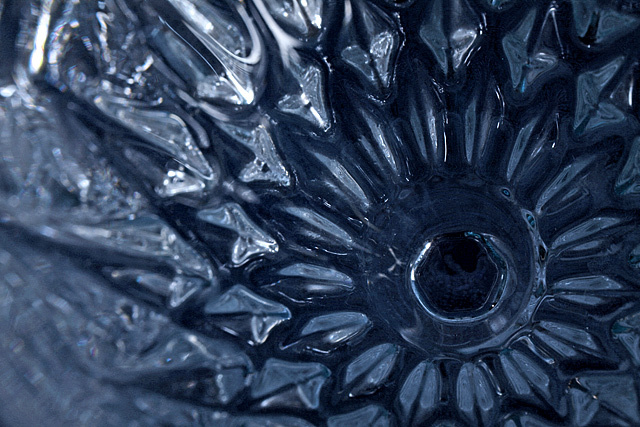 I have always found photographing glass to be a challenge. It is tough to know when the focus is right and I think this photo suffers from that. A bit more depth of field would have helped as well. The left play in the glass on the left side of the image distracts from the central point which have benefited from being lit. basically a good shot but oof area on left detracts. Pretty decent, though different lighting and PP adjustments may have been able to coax a little more "wow" out of the glass. Very pretty. Is the glass blue or is this a background? I only ask because it seems too dark to me. nice try, but this just doesn't really catch the eye. maybe if the shot was taken of the center to create some radial symetry it would have been better. Proudly hosted by Sargasso Networks. Current Server Time: 04/25/2019 07:47:18 PM EDT.